If you are one of the thousands of New Jersey residents whose home lies within the newly drawn FEMA flood maps, you already now how important a New Jersey home elevation is. Super Storm Sandy showed just how devastating flood waters can be to low sitting homes. The redrawn flood maps represent an effort on the part of the federal government to mitigate the damage done by future storms. 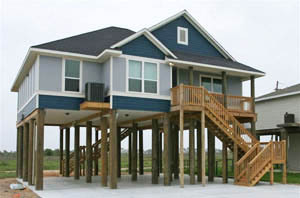 Homes that are lifted onto pilings are much more resistant to the ravages of floods and storm surges. Additionally, homes placed above minimum elevations stand to garner significant saving on home owner’s insurance. Most New Jersey home owners, particularly those who reside within these flood zones, are well aware of these facts and have taken steps to have their homes elevated. What some New Jersey residents might not know is that there a couple different home elevation options available to them. In this article we will explore these different options and explain what pros and cons come with them. Pier lifts are the most common and typically least expensive of NJ home elevation options. With a pier or beam lift the home is separated from its foundations and all utility hook-ups are removed. The home is then lifted to the desired elevation and placed on a temporary foundations of pilings. While the home rests on the temporary pilings, a more substantial foundation of separated support columns is built below the house. Once this is complete, the house is lowered onto the new foundation and all utilities are reconnected. Home owners sometimes choose to have the open foundation enclosed in an effort to produce a more ‘solid’ look or to create more usable storage space. But whether the foundation remains exposed or enclosed, it serves the same function, to keep the main living portion of the home above potential flood levels. 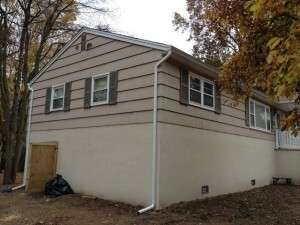 While this process is typically easier and less expensive than other NJ home elevation options, it does come with some drawbacks. The placement of support columns can reduce the amount of usable space below the home. Additionally, some home owners do not like to the look of pier foundations. For these home owners, another option exists. Raising a house onto a slab foundation is a little bit more complicated and affords a couple different foundation options. In one, the home and existing slab foundation are lifted as one. As with a pier foundation, all utility hook-ups must be detached prior to the lift. Once the home and slab are lifted to the desired height, a new continuous foundation is poured beneath the home and pilings are extended below the old slab to support the structure. Masonry skirting is then applied to the old foundation to mask any wearing or weathering. For the second option, the home is separated from its existing slab or foundation and only the walls and roof are lifted. This option is much more labor intensive and time consuming, but for homes with slabs that are too damaged or in need of replacement, it is sometimes required. While a slab foundation can be more costly than a pier foundation, some homeowners prefer the solid look of slab foundations and the greater usable space they provide. There is no ‘right’ option for choosing an elevated foundation. Every home and every lift is unique, and what works for one may not work for another. Whether you choose a pier or a slab foundation, be sure to choose the right home elevation company to handle the job. Penn Jersey Development Company is a home elevation and restoration firm specializing in hazard mitigation and serving the New Jersey shore and all Sandy affected areas tri-state area. With 25 years of experience, hundreds of custom homes, and dozens of NJ home elevations under their belt, Penn Jersey Development Co. has the experience and know-how to complete your NJ home elevation project in a quick and professional manner. I am glad that the article points out that every job is different. This means that one method may not work the best on a certain job. It would be good to hire a foundation lifting company that is capable of using many methods.